Also see: Orange Risdon on the Saline Historical Society website. 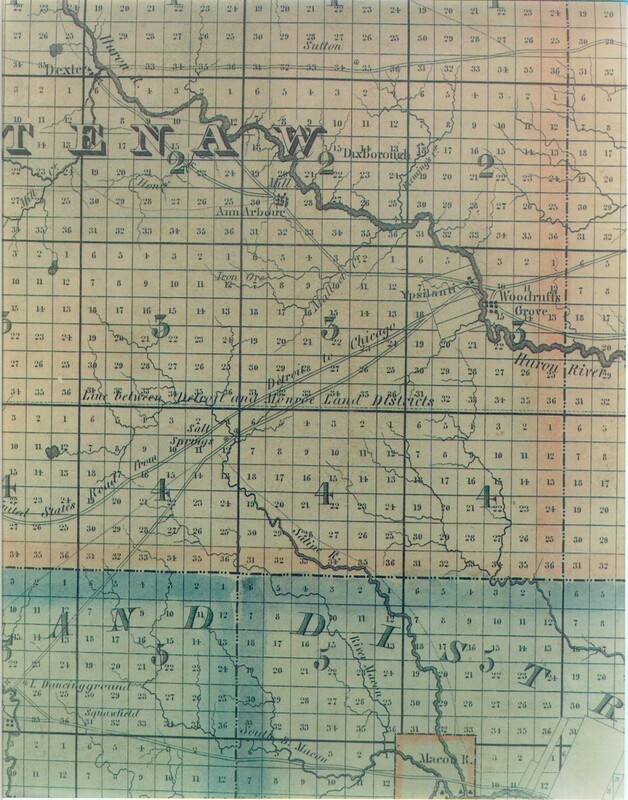 At right is a section of the first map of southeastern Michigan, which was created by Orange Risdon in 1825. This portion includes lands actually surveyed by Risdon, including Pittsfield Township and the Saline area, which he later founded as a community. Pittsfield Township is the first "Township Three" directly west of Ypsilanti/Woodruff's Grove and north of the dividing line between the Detroit and Monroe Land Office areas. Note Malletts Creek in the northern part of Pittsfield Township, along which some of the first homes were constructed and near which the first school in Washtenaw County was built in 1825. Also note the important "United States Road from Detroit to Chicago" -- known originally as the Old Sauk Trail -- subsequently the Chicago Road, US 112, Route 12, and Michigan Avenue. The Chicago Road was surveyed by Orange Risdon, making it one of the first roads layed out with federal funds. When Risdon began surveying the road, it was his intent to make the road as straight as possible between Detroit and Chicago. He started his survey from Detroit, but by the time he reached Pittsfield Township -- and encountered the marshes east of Saline -- he realized he would have to closely follow the original Old Sauk Ttrail to avoid major obstacles like the marshes. Thus, west of Pittsfield Township, the road is much more meandering and winding than is the road between Detroit and Pittsfield Township. For an image of the entire Risdon map and a history of its publication, please see: Publicity for 1825 map encouraged settlement of southeast Michigan. For biographies of Orange Risdon, please see: Paul Krupp's Potluck: Orange Risdon was well-known surveyor - March 8, 1984 and Saline Founding by Orange Risdon: 1824 Anniversary Marked by Mrs. Bessie Carven Collins (reprinted from the Saline Observer, 1883). Source: This image from Risdon's map is provided courtesy of the William L. Clements Library at the University of Michigan. 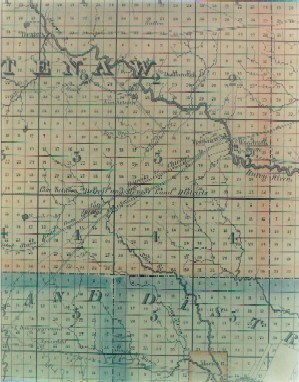 The University owns two of the thirteen surviving copies of the Risdon map. This portion of the map is mounted on the Pittsfield Township Historical Society website with the permission of the Clements Library. Click map for a larger version.